NESC is partnering with ISEN again this Fall to host a career fair purely dedicated to jobs in the energy & sustainability sectors. Last year many students were connected with professionals in industry and 15 companies met many motivated NU students with a vested interest in sustainability. The fair will be held on Wednesday October 15th 12pm-4pm in the Louis room of the Norris University Center. Be sure to bring plenty of résumés with you and any questions you may have about the work that the companies do. The dress code will be business casual. Also be sure to bring your wildcard with you as it will be scanned when you enter. Hosted in conjunction with the fair is an addition to the programming this year: a panel of speakers from the energy & sustainability sectors. On Tuesday October 14th, the evening before the career fair, NESC will host a panel event moderated by Mike Brownell of Dayaway Careers, in which the discussion revolves around careers in energy & sustainability. Young professionals will share their stories of job searching and how they have ended up at their current positions and can answer questions about what employers in the energy & sustainability fields are looking for in eligible candidates. This event will be held from 6pm-7pm on October 14th, in Harris Hall 107. We ask that students arrive early at 5:30pm to help formulate questions for the panelists in break-out groups. For those who arrive at 5:30pm to help with this, food will be served. The panelists will include representatives from Lanzatech, Invenergy & SoCore Energy. 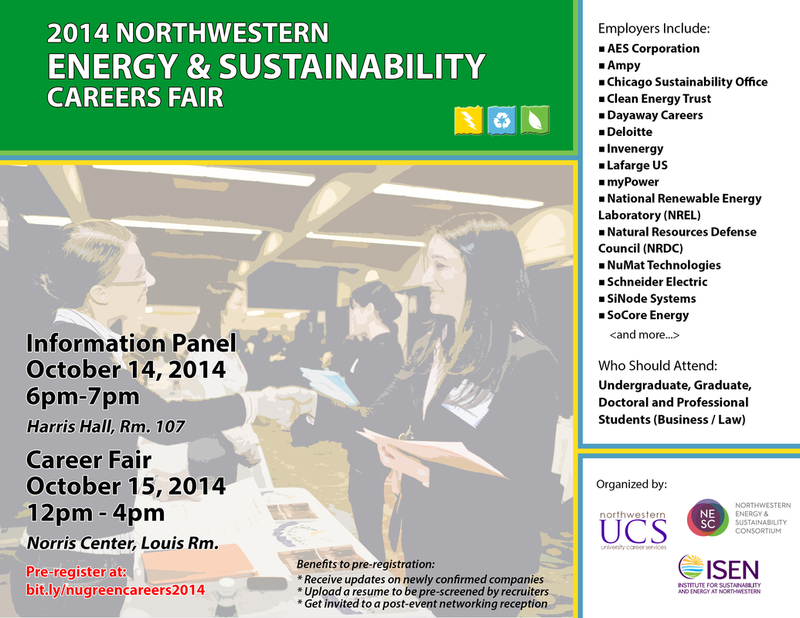 NESC partnered with ISEN and University Career Services to host the inaugural Northwestern Energy and Sustainability Career Fair on October 10, 2013. The career fair aimed to create a centralized forum at which employers could meet Northwestern students interested in pursuing careers in the energy and sustainability sector. Ultimately, our objective was to add value to Northwestern’s energy and sustainability community by facilitating employment opportunities for students. The event catered to 15 energy and sustainability companies, including our primary sponsor Schneider Electric. These companies were able to engage with more than 200 student attendees, hailing from diverse academic disciplines such as business, engineering, science, policy, journalism, and liberal arts. We thank all of our partners and participants for helping us put on an extremely successful inaugural event. As we look ahead to the 2014 career fair, we look forward to receiving your feedback on ways to make the event even better.